Arizona Federal has misleadingly deceptive propaganda on its website in an attempt to justify its wrongful fee. | Arizona Federal Credit Union has a new $3 Monthly Membership Fee! Greedy fatcat managers are forcing members to pay a mandatory $3 ripoff fee every month, simply for being a member. That's not mutually beneficial. ← Arizona Federal Credit Union, Arizona Federal, AZFCU, AZFCU.org Who owns a credit union? Why does Arizona Federal knock banks for a $5 debit card fee that doesn’t even exist, in an attempt to justify AZFCU’s greedy $3 monthly membership fee?? Click image to enlarge for easier reading. Isn’t it ironic that Arizona Federal knocks Bank of America, Chase, and Wells Fargo for $5 monthly debit card fees, which the banks announced in 2011 and quickly retracted in 2011, yet Arizona FCU instituted a $3 monthly fee simply for being a credit union member, even if one does not have a debit card? Why does Arizona Federal have this statement on their website about the banks having a $5 debit card fee when most of the banks cancelled that fee before it began? Is it an attempt for AZFCU to attempt to justify their wrongful $3 fee, not even for having an AZFCU debit card, but just for being a credit union member? In addition, the page states the banks’ 2011 proposed $5 fee would have been avoidable if one does not use the debit card. In contrast, the monthly $3 weasel fee at AZFCU is not avoidable unless you close your membership completely! Why does AZFCU want to distinguish itself as being a worse deal than banks? Credit unions have often promoted themselves as offering BETTER deals on rates and loans than banks since credit unions are member-owned. That is not the case with Arizona FCU. Here are the articles in USA Today announcing the banks were cancelling the ill-advised program to charge a $5 monthly debit card fee. But other big banks have made of a point of publicizing the fact that they don’t charge a debit card fee. Citibank earlier said it decided not to charge a debit card fee because customers made it clear that they didn’t want to pay for the convenience of using their cards. TD Bank put out a press release Friday stating that it will continue to offer its customers debit cards with no monthly fee. TD Bank said a survey of its customers revealed that 70% would discontinue their account if the bank charged a debit card fee. Most small banks and credit unions don’t charge debit card fees. In an effort to attract new deposits, some of those institutions have launched advertising campaigns urging angry customers of big banks to switch accounts. A grassroots effort on Facebook has designated Nov. 5 “Bank Transfer Day” and is encouraging consumers who are unhappy with new bank fees to move their accounts to credit unions or community banks. Charge a fee to use your debit card? Not us! As reported by USA Today, The Washington Post and other news agencies, Bank of America announced today that beginning early next year they will charge their customers a $5 monthly fee if they use their debit cards to make purchases. This follows previous announcements by other large banks (including Wells Fargo & Co., JPMorgan Chase & Co. and others) that they are either testing or fully rolling out monthly debit card fees. 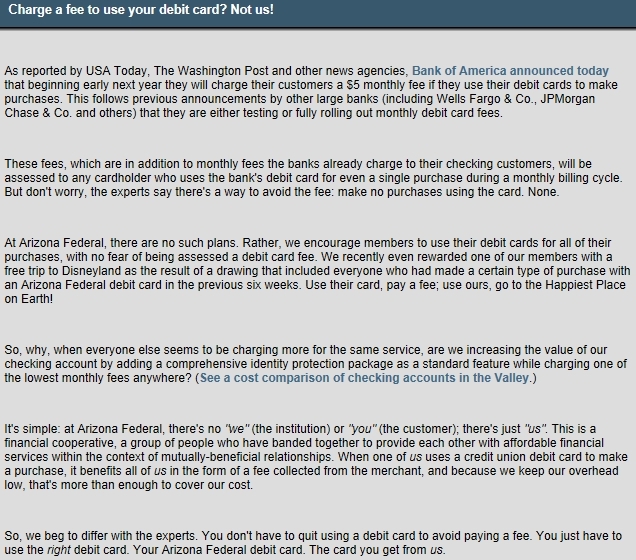 Why does AZFCU have this message on its website, from a USA Today article in 2011, when those banks came to their senses, reversed course, and cancelled the $5 monthly debit card fee? These fees, which are in addition to monthly fees the banks already charge to their checking customers, will be assessed to any cardholder who uses the bank’s debit card for even a single purchase during a monthly billing cycle. But don’t worry, the experts say there’s a way to avoid the fee: make no purchases using the card. None. At Arizona Federal, there are no such plans. Rather, we encourage members to use their debit cards for all of their purchases, with no fear of being assessed a debit card fee. We recently even rewarded one of our members with a free trip to Disneyland as the result of a drawing that included everyone who had made a certain type of purchase with an Arizona Federal debit card in the previous six weeks. Use their card, pay a fee; use ours, go to the Happiest Place on Earth! Charge the members almost $6 million annually from $3 monthly, which is $36 annually, in weasel fees, then brag about giving away 1 free trip to Disneyland and the members should be happy with that? Why not give us some “financial education” that you claim to offer to remind the members that most credit unions and banks offer better rates but without an unavoidable $3 fee charged every month, simply for being a member. A better question is, why, when everyone else seems to not have an unavoidable $3 monthly membership fee, that AZFCU wants to be greedy and punish members for being members? It’s simple: at Arizona Federal, there’s no “we” (the institution) or “you” (the customer); there’s just “us”. This is a financial cooperative, a group of people who have banded together to provide each other with affordable financial services within the context of mutually-beneficial relationships. When one of us uses a credit union debit card to make a purchase, it benefits all of us in the form of a fee collected from the merchant, and because we keep our overhead low, that’s more than enough to cover our cost. Wrong. AZFCU fatcats are taking $3 every month from US. That is not mutually beneficial. Many other banks and credit unions offer rewards directly or indirectly for using a credit card or debit card to make purchases. The only thing “special” that AZFCU is “offering” is a monthly $3 ripoff fee. So, we beg to differ with the experts. You don’t have to quit using a debit card to avoid paying a fee. You just have to use the right debit card. Your Arizona Federal debit card. The card you get from us. We beg to differ with Arizona Federal. You have to avoid being a member completely with Arizona Federal to avoid paying a fee, because they punish their members $3 every month with an unavoidable monthly $3 weasel fee, whether you have a debit card or not. Arizona Federal claims their debit card is better when they say “you don’t have to quit using a debit card to avoid paying a fee.” Yet Arizona Federal won’t let you avoid paying a monthly $3 weasel fee, even if you don’t have a debit card with them, and only have a basic share savings account! This entry was posted in angry members, banks, competition, principles, values, listening to members and tagged $3, $5, atm, avoid, avoidable, bank, banks, card, charge, credit, debit, debits, due, dues, fee, member, membership, unavoidable. Bookmark the permalink.